Vremi Products have me sold! 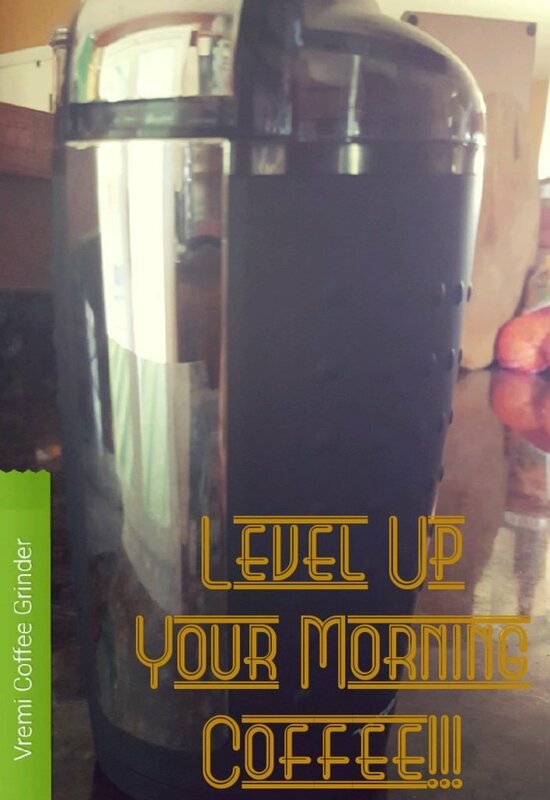 This coffee grinder helps take our coffee to the next level and the knives are awesome! In our house, if coffee is not made we do not socialize, speak, or look at each other for at least a couple of hours. It’s not that we don’t love each other, we just don’t love mornings and seem to agree that until coffee is had, nothing else happens. The Vremi Coffee Grinder has taken our coffee to the next level! It’s amazing the difference freshly ground coffee beans make! In less than a minute, we can grind fresh beans for perfectly roasted coffee! It takes a bit of practice to figure out just the right amount of beans, but it’s totally worth it! We are not big on single purpose items in our house. There are too many and we do not have enough space for all the silly gadgets I’d be willing to get! No worries though, you can also use the Vremi Coffee Grinder to grind up herbs! Coriander gets ground a lot in our house! Clean up is amazingly easy, after you grind your delicious coffee just wipe the Vremi Coffee Grinder out with a cloth and put the lid back on. No need to even wet the cloth! We prefer microfiber as it seems to take less work. 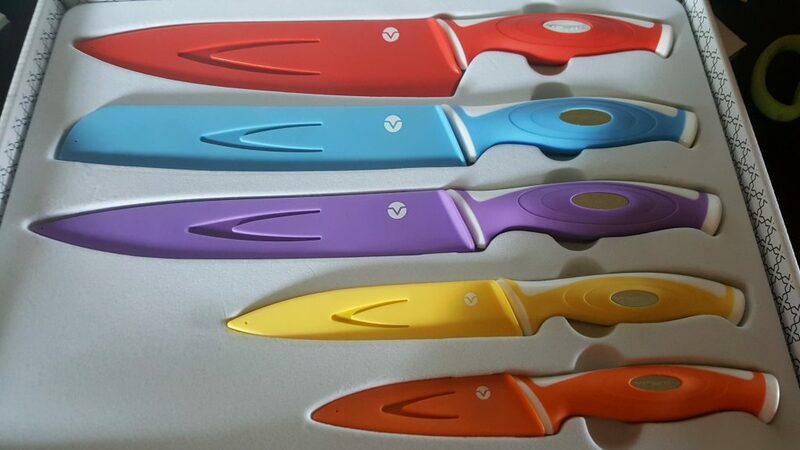 The Vremi Knives had me at colorful. Not gonna lie. I love the bright colors, they make me happy! I understand that’s not at all related to their purpose, however I don’t care. They are pretty and that’s a bonus for in my book! 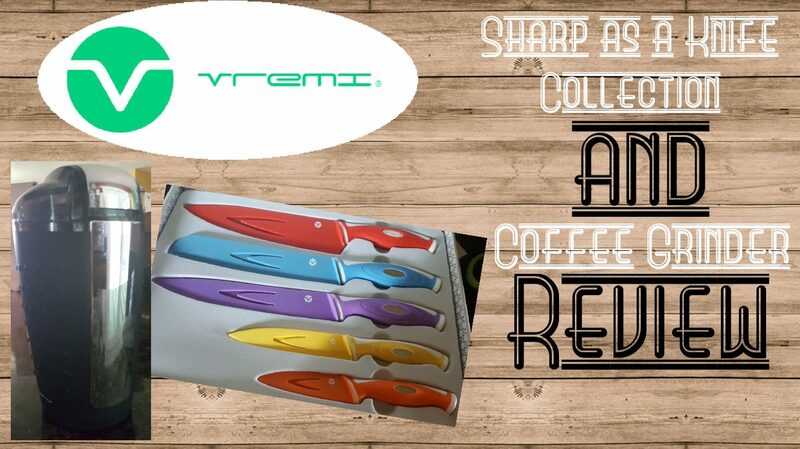 Another fantastic aspect of the Vremi Knives are the sheaths that come with them! The worry of them getting dull by being rubbed against other stuff is eliminated with these fabulous covers. It also helps to ensure that you don’t accidentally cut yourself when reaching in the drawer! While this is not related to the knives, I felt it important to say that a good knife sharpener is essential. We have a Rada Knife Sharpener that my Momma bought us years ago. My husband loves it so much he takes it with us when we plan to cook somewhere (along with his favorite knife, lol). He is very into cooking and gets rather frustrated if a knife is dull. Never, EVER put knives in the dishwasher! The debris flying around while they are washing can and will dull the blades. Wiping the blades down with a wet wash rag will generally do it, but if you are cutting meat make sure you sanitize it! It’s always best to dry them immediately and put away. Vremi has generously provided not only the products for the review, but also a set for one lucky winner! What a perfect gift for Father’s Day or anyone really! My niece is planning to get married next year and this is on the list of gifts I’m looking into getting her. She is my very first niece so I have to make sure whatever I get her has been well tried out! She’s not special at all….. lol. Of course, all of my nieces are crazy special to me, she just happens to have been the first. I’d love to hear about how you grind beans, especially which ones you’ve found to be the best! I’m on an exploration mission!